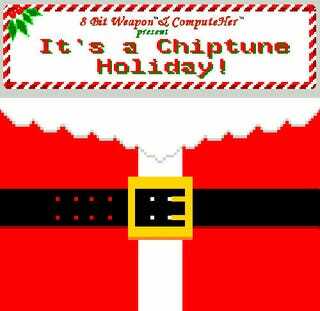 Bloop and beep in the holidays with 8 Bit Weapon & ComputeHer's It's a Chiptune Holiday, an album filled with traditional holiday favorites, only better. 8 Bit Weapon is one of my favorite chiptune bands, using their arsenal of old computers, consoles, handhelds, and various electronic toys to craft some very impressive tunes. Their holiday release, It's a Chiptune Holiday, is an exquisite example of what traditional music can become in the hands of capable 8-bit artists. The album features 8 tracks perfect for replacing your family's traditional holiday music, at least until they figure out what you've done. You'll probably get away with "Ave Maria," "O Christmas Tree," and possibly "Joy to the World," but the beats in "Deck the Halls" and "Jingle Bells" will be a dead giveaway, and that's only if they manage to miss the electronic voices. And yes, they've got Hanukka in there as well. It's a Chiptune Holiday is currently on sale at both 8 Bit Weapon and ComputerHer's websites for $9.95, with each CD shipped in case handcrafted from a 5.25" floppy diskette. It's the perfect way to remind your family that you're the odd, video-game loving member of your household.